Formula 1: the pinnacle of motorsports. This is the world’s most popular form of racing, featuring the world’s greatest drivers competing in the most technologically advanced cars ever created, machines designed and built by some of history’s most brilliant engineering minds. For Art of the Formula 1 Race Car, master automotive photographer James Mann has brought a selection of these spectacular machines into the studio, and through his lens we see not just the engineering brilliance of these cars but also their inherent beauty. 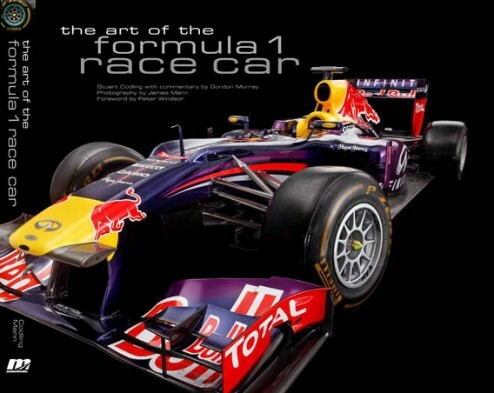 They are works of art, the fascinating results of Formula 1’s mix of competition, creativity, and human ingenuity. With historical and technological profiles by Formula 1 writer Stuart Codling, and commentary from multiple-championship-winning designer Gordon Murray, this book is the ultimate homage to the ultimate breed of race car. Sold out : stock available on Amazon.